He’ll eat the cake later. He’s a teenager and needs more substantial food than cake, The pizza has food from all the food groups and is actually better than cake. His body knows that, so he reached for the right thing. Those look like sweet pickles, anyway … hate ’em, myself. Try Claussen’s … they’re not cooked, so you find them in the refrigerated foods. Get the dills. I’ll even eat ’em for breakfast. Yes. He ate the cake later. I’m learning quickly that teenage boys eat A LOT. I happen to be a pizza lover and have often advocated that pizza is the perfect food containing all the food groups if you build it right. 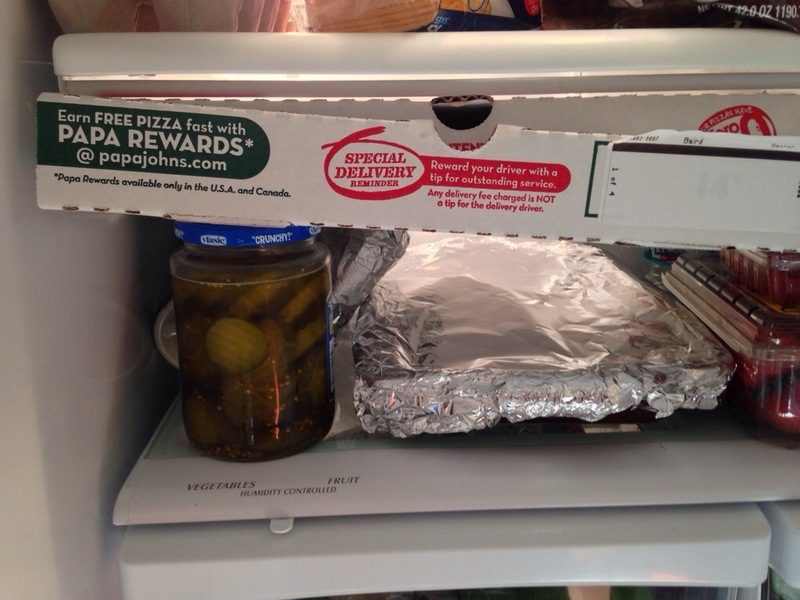 The leftover pizza has all disappeared as of last night. Now, as for the pickles, how in the world can you tell they are sweet, actually bread and butter, from a side view photograph? The color? I prefer bread and butter on my burgers because that is the type my mom pickled when I was a child. They are a store bought taste of home. I like dill too, but prefer Vlasic whole or spears. My husband shared your preference for Claussen dill. When they’d be on the grocery list sometimes I’d forget they were refrigerated and come home without them. Tomorrow it’ll be nine months since he died and I’m still finding food reminders of him in the house. Though his favorite pickles are gone, a few days ago I found an open can of lightly salted cashews. Lightly salted because he had high blood pressure, but still one of his favorite snacks. LOL … growing up in a Jewish milieu, you get a feel for stuff like the pickles. You can tell without asking. I stopped the other day at a local chain called Kopp’s which started out as an ice-cream business, and ordered a burger with bacon on it, and big ol’ slices of onion. She asked “Pickles?” and I immediately thought of my lost one … she always would say “Extra pickles.” meaning the transversely-cut dills … so I said “Yes, extra pickles.” Damned good burger … Kopp’s burgers might better be termed “gut bombs”, they’re a good 6″ across, and nothing is skimped. It took me a good 45 minutes to eat the thing, then I had to drive home. That last is a danger with diabetics … for a diabetic, a sugar rush is a nap, so you have to be careful. F’rinstance, I just made two fair-sized chicken breasts parmigiana, and I’m anticipating a reaction of that sort. I had to cut Mary Ellen’s up real small, on accounta she gots no teef, but she managed to eat it without complaining. In her dotage (LOL) she’s gotten so she only likes food that doesn’t taste like anything. I like spices and flavours, so there’s always a bit of friction. I never heard of lightly salted … I’ll have to try to find some … I love roasted, salted pecans. I don’t really like all the salt, and I have to watch it, too … I sometimes get to the point where I can’t get my damned shoes on. I got the doc to give me a ‘scrip for Lasix, that I could take in a moment like that. It’s been on the shelf for about 8 months, now, and I’ve only taken one pill, so I reckon I’m doing OK.